The beer business is booming in the district, with several breweries opening in the past few years, and now the city also has its first liquor distillery in more than 100 years. New Columbia Distilleries, maker of Green Hat gin, is part of the redevelopment of the city's old warehouse district in northeast Washington off New York Avenue. The industrial area is transforming into new retail and residential housing. 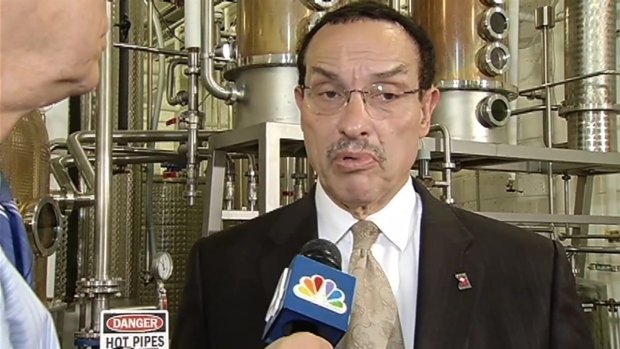 Mayor Vincent Gray hosted a news event at New Columbia promoting creative businesses as government work shrinks. “It's yet another example of the city becoming more self-reliant,” he said. The District has a booming business in beer. Several breweries have opened up over the past few years, but the city now has its first liquor distillery in more than 100 years. Tom Sherwood reports that Green Hat Gin is part of the redevelopment of the city's old Warehouse District in northeast Washington off New York Avenue. Ward 5 Council member Kenyon McDuffie praised a new, five-year plan to speed up the area’s redevelopment. Co-owner Michael Lowe is a retired lawyer who got bored and teamed up with his son-in-law to learn the business. He said they are already looking to expand operations and are working on a winter gin.